There could not be a truer statement. Oysters are certainly not very attractive and border on disgusting to look at, so what ever possessed someone to try them? I know I was a brave woman to eat not just one, but two semi-raw oysters for breakfast while at Kiawah Island Golf Resort in April. Gulp. It had been 33 years since I last took the raw oyster plunge. I was living in Ocean City, Maryland one summer during my college years and after a few beers I decided to join in the fun with friends. Well, I declared at that moment those slippery little slimy creatures making their way down the back of my throat were not for me and that was the last time. 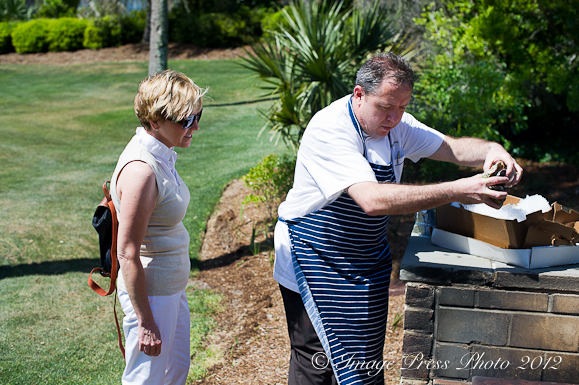 That was until Chef Robert Wysong wanted to demonstrate a very special oyster roast for us at The Sanctuary. Look at those huge oysters! 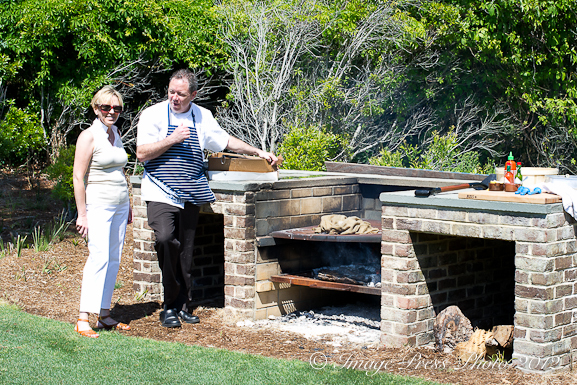 Some of the most memorable experiences we had during our recent trip to Kiawah were spent with Robert Wsyong, the Director of Restaurants & Executive Chef at The Sanctuary at Kiawah Island Golf Resort. In keeping with the property’s commitment to preserve what is local and natural, the first meeting with Wysong was spent talking about a local tradition, roasting oysters. 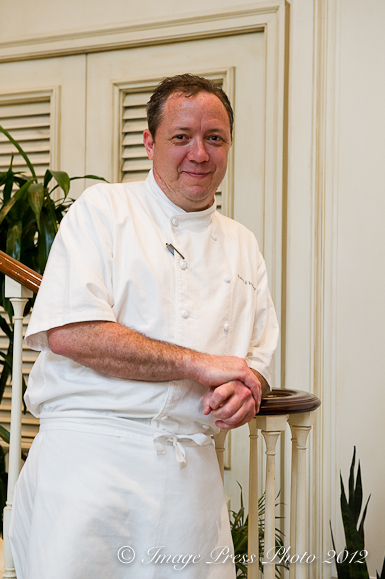 Originally from Maryland, Chef Wysong knows a thing or two about oysters and chose a new coastal home wisely when he moved to South Carolina in 2004 to open The Sanctuary hotel. A graduate of Johnson and Wales University, when it was in Charleston, S.C., Wysong worked at other private clubs and hotels during his career including The Grove Park Inn and Spa (Asheville, NC) and the The Ritz Carlton Golf Resort (Naples, FL). He jokingly referred to himself at the “hotel vagabond”. Not bad hotels to take up residence in, I would say. While these properties are beautiful places to work, working as an executive chef at a hotel and in particular, opening a new property, is very stressful (and he has opened two resort properties in his career). What we often forget is that it is also stressful on the spouse and family. You might be familiar with this recent article, Marrying a chef is a recipe for disaster!, written by Tess Floyd. Balancing personal life and work life is a challenge for all of us. Chef Wysong shared a personal thought with us that he and his wife went through a bit of a rough patch early in their marriage (they have now been married 13 years). “It was our personal commitment to the marriage and a willingness to change some expectations and modify some behaviors that allows us to have a strong marriage today”. That is advice that we can all learn from. When he arrived at Kiawah in 2004, Wysong took notice of what he thought were barbecue pits or grills in people’s yards. They were at least 25 years old and in some cases, much older. He eventually discovered they were oyster roasting pits and this was a very popular way of preparing oysters in the region. He wanted to recreate that local tradition at The Sanctuary for their guests. The pit (in the photographs) is used for smaller functions. For much larger Oyster Roasts they use their venue at Mingo Point. You might remember the pictures of Mingo Point from my prior articles. I can’t do the raw oyster thing: I believe I’ve figured out that I’m allergic to oysters. But: I think the soft shell crab sounds FABULOUS! What a pleasure it must have been to visit there, and interview Chef Wysong! I ate my first raw oyster in Paris at the age of 26 and there was no turning back although I prefer some kinds of oysters over others. 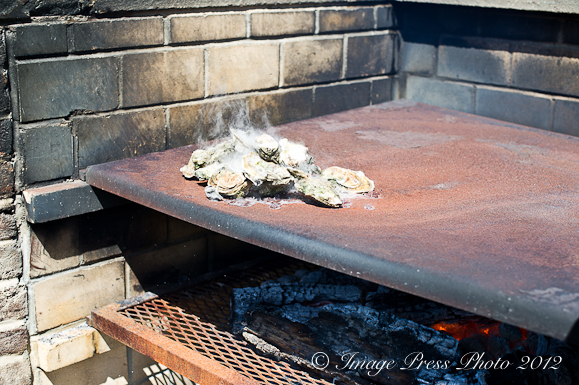 I’d love to try a smoked oyster…. but more than anything I prefer crab and this recipe sounds out of this world!!! I’m so loving your adventures and the chefs you meet are incredible and so passionate! I pass on the raw oysters too Gwen. Smoked are my favorite and down here the locals do a wonderful job with them. 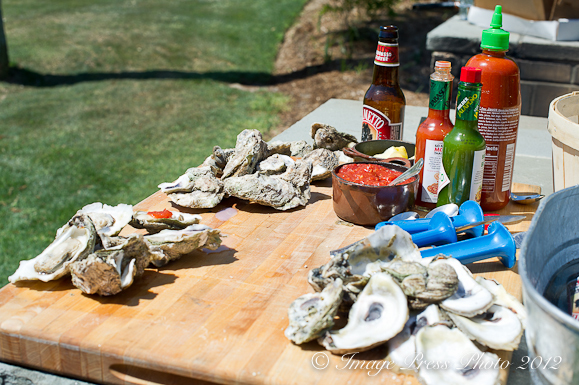 I immediately pick up the Tabasco sauce in the photo, a must for oysters both raw and smoked. Any local fishmongers that you came across on your trip? Only the gentleman that were mentioned – the local shrimper and the place where we met the chefs on the dock, Cherry Point Seafood. That was also several years ago, so things may have changed.